When passengers alight onto the platform at Portsmouth Harbour train station, many are unaware that the waters of the Solent swell just metres below. 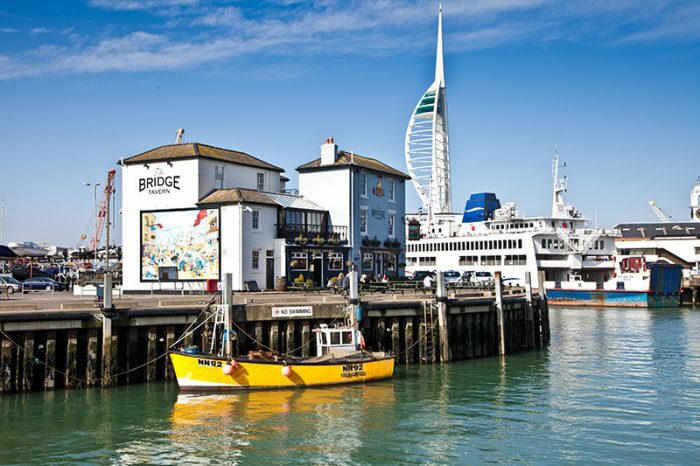 Thanks to this prime coastal location Portsmouth has prospered steadily throughout history, its importance as a maritime centre well documented from Tudor times. Henry VIII’s interest in nautical affairs influenced Portsmouth’s harbour activity and the development of its coastal defences, parts of which stand to this day. Southsea Castle squats on the landscape, a revolutionary artillery fort built the year before the king watched his beloved flagship Mary Rose battle against the French in 1545. The city itself was largely decimated during the Blitz of the Second World War, and only mere suggestions remain of the Portsmouth of old: a rare clutch of 17th-century Dutch gables frame Lombard Street and a patchwork of older houses nestle among the post-war buildings in the High Street. Conversely, the city flourished during earlier wars in the 18th and 19th centuries when its Tudor dockyard expanded to meet the demands of frequent conflicts with France. At the time of the Napoleonic Wars the dockyard was a vast employer, but its appeal has since transcended to meet the recreational demands of holidaymakers. Portsmouth is in fact an island community, the barely perceptible link to the mainland via road and rail bridges. Within this compact Portsea Island are wide areas of green space, fringed with long esplanades and shingle beaches. Day and night the city is abuzz – there’s the sense of anticipation as ships and ferries slide in and out of the harbour, voyages bound for the Continent, the Isle of Wight or, for the harbour fishing fleet, just far enough to harvest the best catch. “We’re trying to raise the profile of the city as many people bypass our attractions on the way to catch the ferry. They may not realise how much we have to offer,” says Louise Rodwell, Tourism Officer for Portsmouth. One of the most obvious attractions is the Historic Dockyard, a fascinating site featuring three important warships: the Mary Rose, sunk in the Solent in 1545; HMS Warrior, the first iron-hulled warship which met its 150th launch anniversary on 29 December 2010; and HMS Victory, Horatio Nelson’s vessel, which saw action at the Battle of Trafalgar. On its deck a plaque marks the spot where Nelson fell after being fatally wounded in the conflict on 21 October 1805. Families limber up to negotiate the flights between decks aboard the Victory, admiring the cannons, the gleaming tableware, and the cradle-like bed in which Nelson slept. Guided tours reveal more about life on deck, and during busier times visitors are free to roam the ship at leisure. Those wanting to find out more about Nelson can venture into the neighbouring Victory Gallery in the National Museum of the Royal Navy on the harbourside and discover the story of the Battle of Trafalgar. Highlights include a walk-through exhibition designed to look like Victory’s interiors, while various interactive displays keep curious minds happy. The museum has just been awarded Lottery funding which will cover the building of a new gallery, set to open in 2014, with a host of information on the navy of the 20th century and completing visitors’ journey through maritime history. The discovery of the hull of the Mary Rose which was raised in 1982; originally many of the Tudor ship’s salvaged artefacts were stored at Southsea Castle until a boathouse within the dockyard became available to adequately house the collection. Then, in 1987 HMS Warrior arrived in Portsmouth from Hartlepool following conservation work. A short walk from the Historic Dockyard leads to Gunwharf Quays where shiny designer outlet stores, cafes, restaurants and leisure centres are neatly stacked against the harbour backdrop. Further afield are the bohemian shopping streets of Southsea, also known as the ‘villa suburb’, developed by architect Thomas Ellis Owen in the 1800s. Tucked away in a nest of modern housing north east of the Historic Dockyard is the Charles Dickens Birthplace Museum on Old Commercial Road. This was once the city’s busiest thoroughfare but is now a leafy cul-de-sac, housing a small number of unassuming townhouses. One of these elegant buildings witnessed the birth of Dickens on 7 February 1812 and a tour of the rooms, preserved to look as they did in the 1800s, reveals some of the author’s personal belongings, including the couch on which he died. Other men made names for themselves in the city. In the early 1800s Sir Marc Brunel developed his pioneering block-making machines here, the first metal machine tools in the world. Sir Arthur Conan Doyle established a medical practice at Bush Villas, Southsea in 1882 and created his Sherlock Holmes stories there. Reminders of the city’s military standing are celebrated at every turn, and the D-Day Museum on Clarence Esplanade and Royal Marines Museum at Eastney Esplanade deftly explain wartime efforts. The city is a good place to explore on foot. Don comfortable shoes and take a guided tour: take in the fortifications or the pubs of Old Portsmouth. Perhaps the best place from which to appreciate the lie of the land is from the giddy heights of Spinnaker Tower on Gunwharf Quays. Similarities of this pinnacle of 21st-century design are often drawn with Dubai’s Burj Al Arab Hotel, which was also designed to look like a sail. Like Dubai’s waterfront hotel, Spinnaker Tower is a symbol of the investment that has transformed the city. From 547ft up views stretch as far as the Isle of Wight. Meanwhile it’s business as usual at ground level, the harbourside a spectacle of efficiency as vessels negotiate their arrival and departure around the clock.